It may have been my music theory professor, Dr. Underwood, who said something about Adams Book Store while I was a student at Henderson State University in Arkadelphia, Arkansas. I was pleased to find this store located in a house at the east end of Main Street and visited it several times. I had a few short conversations with Mr. Adams while browsing. I remember being immediately impressed with him. I had never seen a bookstore like this. It was filled with an eclectic and rich collection of books, and he seemed to know where every single one was located. On one of my visits, he wheeled up and asked if I would help him get something from his living quarters. He may have asked me to move something or retrieve a book from his personal bookshelves but while we were back there, he asked if I might be interested in working a few hours a week. I had no idea at the time but would later realize I was beginning a learning association as significant as any that would occur during my college years. He would become a professor, friend, and mentor. My only regret is that I didn’t ask more questions, listen much closer to what he said, and take notes. I learned later that he’d broken his neck during an Arkadelphia High School football game in the late 30s. It was to be his last football game because his Aunt Bessie wanted him to devote more time to his piano practice. He was in the eleventh grade. This left him a quadriplegic. He was able to move his arms some and could type by pecking his manual typewriter using a pencil secured to his palm with a rubber band. His breathing was labored, and he would pause for a breath of air before speaking. I was thinking about him recently and decided to Google his name, fully aware that he’d died in the mid-1980s. 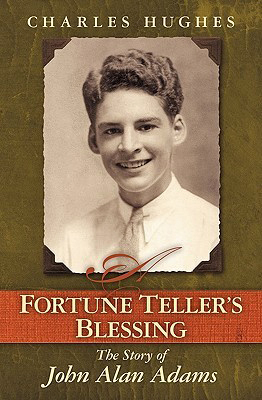 I discovered that a biography had been written, entitled Fortune Teller’s Blessing, by Dr. Charles Hughes. I immediately downloaded the e-version and began a fascinating read, learning much of my college mentor’s fascinating backstory. Occasionally, John would ask if I’d ever read a certain author probably knowing that I hadn’t. He would then give me a book by the author or a collection of poetry containing poems by the author he’d mentioned. When I got close to doing my internship, he gave me a hardback copy of The World Bible, a collection of excerpts from many sacred texts. 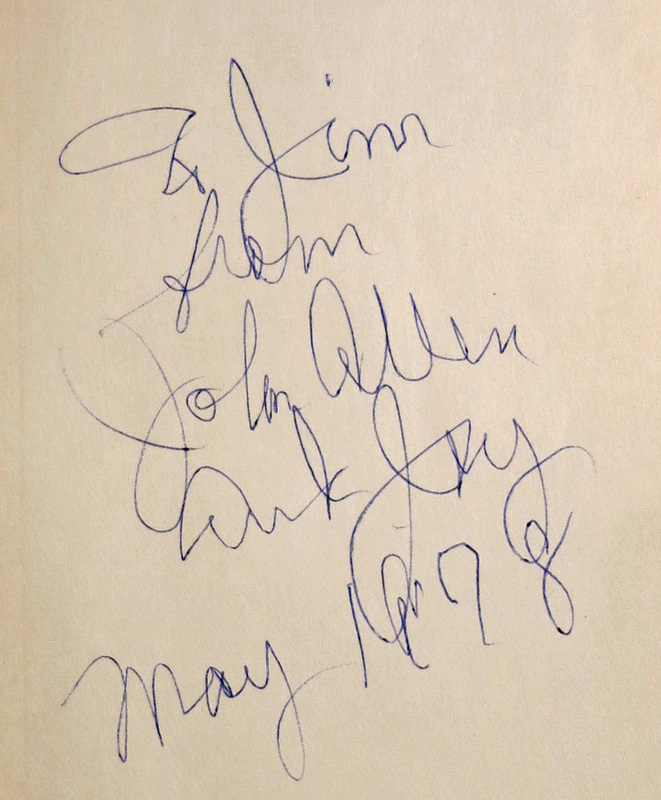 It was signed “To Jim from John Allen and Joy, May 1978.” Joy was his wonderful wife. She took great pleasure in telling me step by step cooking instructions. It was a struggle to listen politely, but she was a sweet lady. I gradually learned that Joy and John were at polar opposites in some areas of philosophy and religion, but their relationship worked. John was gentle and kind in word and deed, but he was a deep thinker and able to discern thin thinking on my part though he would never confront me directly or belittle. He would simply ask a thoughtful and well-placed question or two and allow me to discover my wayward thinking on my own. I remember being surprised to learn that during the late 60s and early 70s, John’s name was placed on an FBI watch list containing vocal, and possibly radical, objectors to the Vietnam War. He thought it was odd that they would be concerned about a man confined to a wheelchair in a small town in Arkansas, but his writing had gained their attention. He took some pride in being on that list. In the afternoons, John would carefully turn on his stereo next to his desk. He would invite me to listen with him as he played a classical selection, occasionally commenting on its beauty or sharing a little tidbit about the composer. Although I was a music major, I think this may have been the first time I actually sat still and listened carefully to music for pure enjoyment. John would take a deep breath, close his eyes, and sign slightly as the music began. 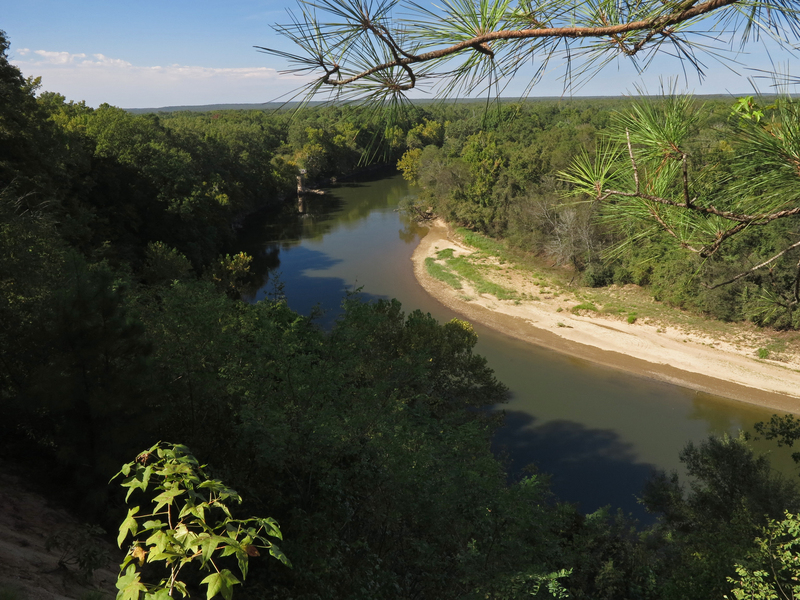 I wonder if he thought of his youth and how he would explore the bluffs of the Ouachita River close by. I wish I could listen to music with John. I’m thankful to have known him but still miss him very much. Dr. Charles Hughes’ most recent book is A Fortune Teller’s Blessing—The Story of John Allen Adams. During the depths of the Great Depression a handsome and gifted seventeen-year-old high school athlete saw his future shattered when his neck was broken in a football game. Few at the time thought the honor student, Eagle Scout, editor of his school paper, and president of his class every year since the seventh grade would survive. But John Allen Adams, son of a carnival fortune teller, did survive and was able to adapt to his severe handicap and go on to lead a remarkably successful life. Though left a quadriplegic, he proved to be a man of extraordinary inner resources, one who found freedom while bound to a wheelchair and independence while almost totally dependent on those around him. 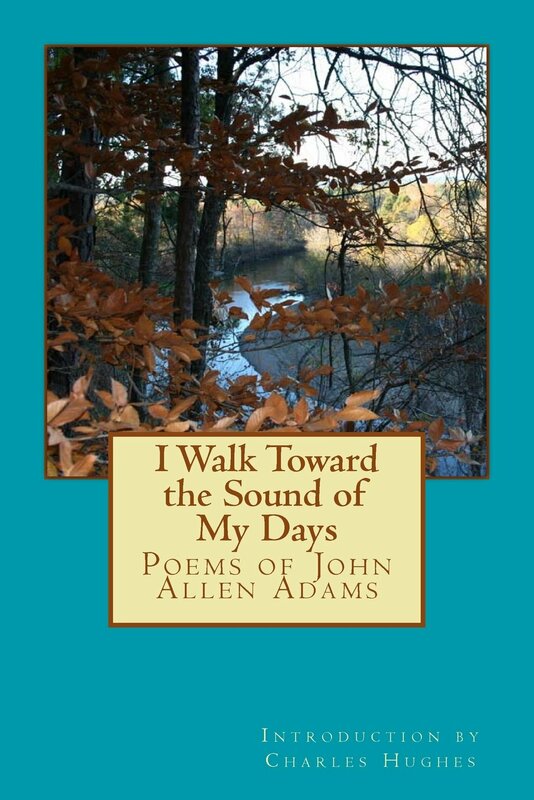 June, 2015 Update: A collection of John Allen Adam’s poetry was recently published. This will be a treasure! Thank you Dr. Hughes! By ozarkmountainhiker in Uncategorized on February 26, 2013 .